This past week has been a fun ride! It started Monday when our Internet went down. The WiFi in the house was okay, but there just wasn't any Internet. It almost felt like we'd been cut off from the rest of the world. It wasn't too bad. We were still able to text or iMessage other people. That was a plus. Sometimes we put too much stock and/or rely too much on modern technology. I like the simple life, myself. The Internet provider was able to get the problem remedied before our Skype language lesson on Wednesday. I am grateful for that as my lesson went quite well. Micah is very patient and positive. As we were conversing, ever so slowly, the Spirit touched my several times. I had to ask Micah what the Malay word for "weep" is. I've never had that problem arise in a lesson before. We were talking about the language and the people. It was a blessing that the Internet was up for our lesson. The Internet went down again on Thursday and wasn't restored until late Friday afternoon so we missed our Skype lesson with our language coach. I wasn't happy to have to tell Bryan about the problem, but he was understanding. You can't Skype unless you're connected to the Internet. It may have been a blessing not to have the Internet for Thursday and Friday. We were occupied with other matters. Our mission president and his wife, President and Sister Mains arrived Thursday to conduct interviews with the young Elders in the zone prior to our District Conference this weekend. We had the privilege and opportunity to drive them to the various missionary apartments, drive around the city looking for possible new missionary housing (Missionary housing could be an entire blog by itself! I previously started a discussion about that. This story continues to grow. I will have to continue it another time . . . if I don't forget! ), or back and forth to the church and their hotel. We had great lessons with our language tutor this week. We each get our own 45 minutes with him. I finally figured out what works bests for me. We had a pretty good discussion today, mostly in Malay. I'm working on just understanding what I hear. We spoke a little English today. Next week our tutor is planning on speaking only Malay to me. That's going to be difficult, but okay. My understanding with him is picking up. I'm feeling much better about the language today than I did yesterday. Speaking is another issue which will eventually come as my understanding increases. Sister Bodell had a good discussion with him, too. She found out that he was assigned to find new housing for the missionaries when he was serving here in the mission. She got got some good help from him. He also has an iPhone we can iMessage when we need to for help. Friday night Sister Bodell made a large pot of chili and some corn bread to take over to Elder and Sister Mills' place for dinner. President and Sister Mains normally take the senior couples out for dinner, but Sister Mills had fallen recently and broken her knee cap so we all went to their place for dinner. I should add here that corn meal cannot be had anywhere in Malaysia, which is really strange since the people eat a lot of corn here. Sister Bodell had to make her own corn meal by putting popcorn in the chopper attachment for the food processor. She managed to produce a useable corn meal to make the corn bread. It turned out very well. She had also found a recipe that was delicious for the corn bread. It was a great meal and great company. District Conference consisted of four meetings. The first was a leadership conference Saturday afternoon at 4:00 P.M.. It was followed by an adult session at 7:00 P.M. Sunday morning was the general session. It was followed by a short meeting in which the Branch Presidents and young Elders introduced the recent converts and investigators that were in attendance at Conference. President Mains walked around the chapel, shook hands with each one, and welcomed them. I thought it was an excellent meeting. He also spoke about the road they were on back to our Father in Heaven. One of the highlights of Conference included the District Choir which sang with the angels of Heaven. Sister Mains told me that there has never been a choir that sounded so good in Sibu. I am grateful that we had the opportunity to participate with such a wonderful group of people. The District president said he'd like to see the choir continue. President Mains said the same thing. 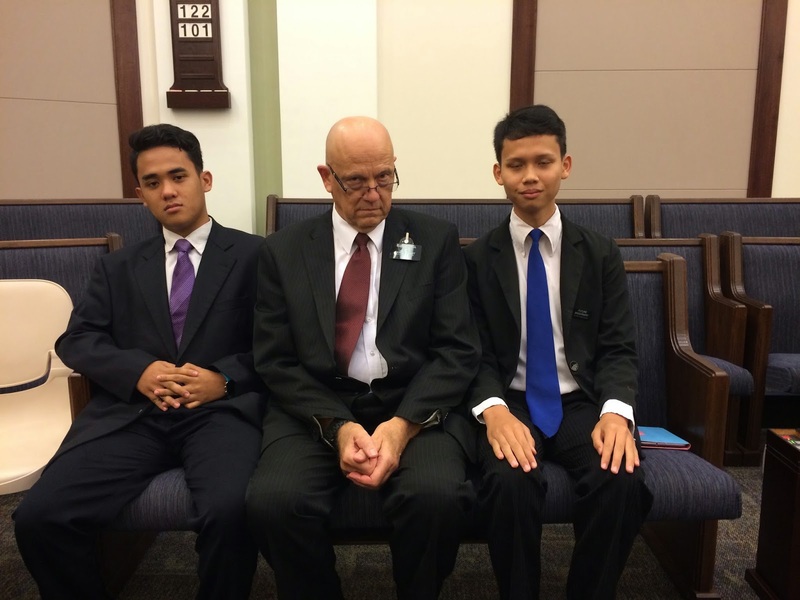 They should sing in Sacrament meetings on a regular basis. The talks were also good. It was interesting to hear the missionaries translate. Those of us who are non-Malay speakers were able to wear earphones and listen to the missionaries translate from Malay into English. After Conference, we brought the Mains and the Tedrows back to our house for lunch before sending them home back to Mukah (a two-hour drive for the Tedrows), and to the airport to fly back to Singapore. Later we picked up the zone leaders out in Rantau Panjang (a 30-45 minute drive depending on the rain and traffic.) Yes, it was raining tonight so it took a little longer. One of the hardest things for us as a senior couple is transfers. 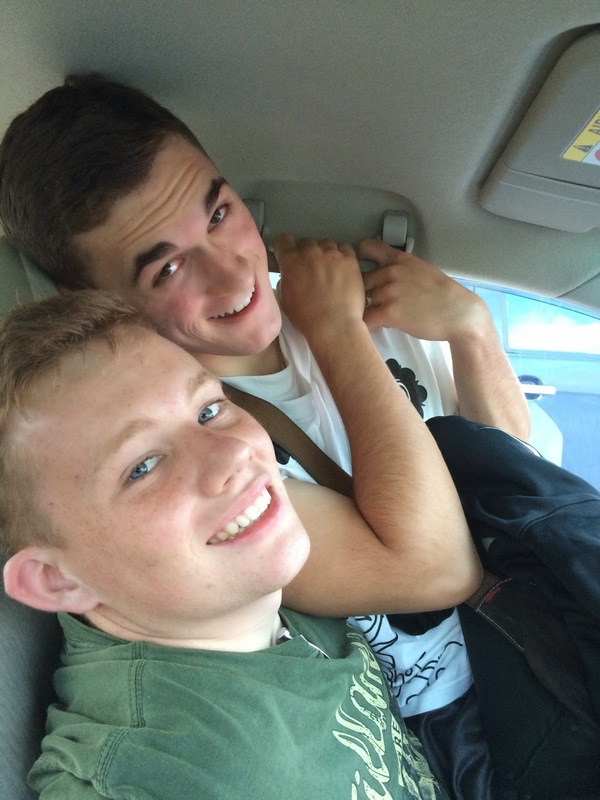 We get attached to some of the missionaries, and then they're gone. This is transfers week. We will probably lose and gain a couple of missionaries. We know we're saying good-bye to Elder S. He leaves Sibu on Tuesday to meet his parents in Singapore for a little touring before heading home. His mission is complete. He and Elder H are coming over for lunch tomorrow. We will miss him when he's gone. Here are a couple of pictures. There is one more of the ZLs that I should post, but it's on Sister Bodell's iPhone. I will post it later. I picked up the ZLs, Elders H & S, upon their return from MLC, They had to scrunch up in the front seat because the back seat had a bicycle in it. Lawren, Pres. 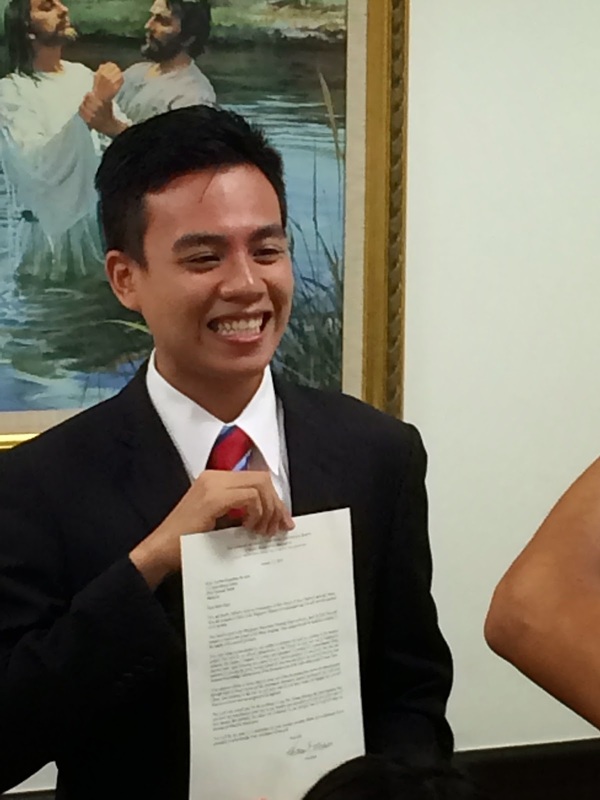 Gara's son, received his mission call this week to the Singapore Mission. He was excited! Two good friends, Rolyn and Ostine, from Sibu Jaya. We became good friends at Youth Conference. They were great supporters of the District Choir. Rolyn turn 18 next year and will be submitting his mission papers then. He is excited to serve. 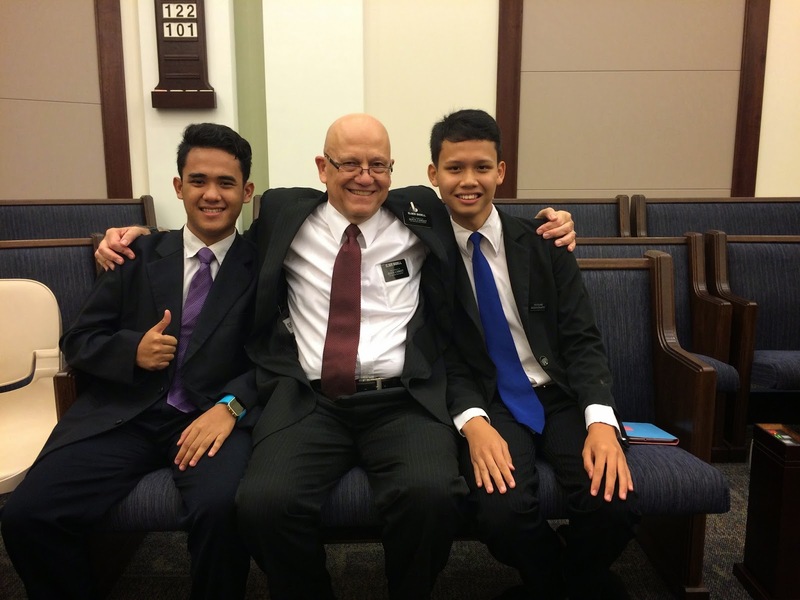 Ostine is only 15 right now, but he's planning on serving a mission as well. 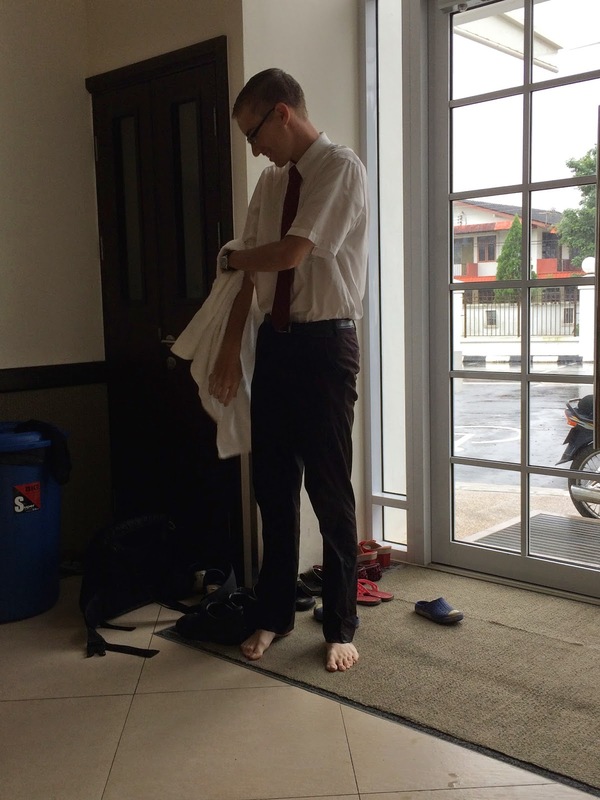 Elder L arriving at District Conference Sunday morning after a 30-minute bike ride from his apartment. Why the towel and bare feet? It was raining his entire trip. He was soaked from head to toe! This is a test. I've heard there may be a problem posting comments here. It looks like you have to sign into Google or another program before it will post. Please let me know if you have problems posting comments here. Thanks a bunch!